Having grown up on the edge of the dramatic Norfolk coastline, I have always felt an innate affinity with the sea. With nothing between our house and the ocean, it was always the first place I went when I wanted to think, relax or escape. Growing up on a cliff top you take for granted the feeling of being on the edge of the earth, staring out towards the horizon and seeing nothing. It has the ability to put the world in to perspective and make you feel so small… but staring out at the rest of the world also instils you with that precious childhood belief that anything is possible. At night I would drift off and dream of faraway lands where every day was summer and every road led to a new adventure- castles to discover, beaches to roam, mud huts to build and sweet shops to raid. There was no homework here, no rules, just adventures. It was one big treasure hunt, no wonder I woke up exhausted every day! Okay, so since fleeing the nest and getting out in to that big wide world I have admittedly become somewhat more cynical (well, come on, 60p for a Mars Bar – hold off that sweet shop raid!). Yes, reality has hit- it turns out career ladders are much harder graft than climbing frames, wrinkle filler isn’t as much fun as face paint and Monopoly totally lied, Park Lane definitely isn’t £350 (but I think the wrinkle fillers are). Contacts, contracts, chores and bills have all faded my rose-tinted lenses, but luckily I had never given up searching for that treasured island… who knew it was closer than Birmingham! Yes, just 100 miles south of Britain, in the bay of Mont St Michel stands Jersey, the sunniest of all of the British Isles. Referred to as ‘a peculiar of the crown’ this mysterious self-governing land has a fairy-tale like quality. Its unusual arrangement sees it answer to the British Crown, but not to the British Parliament (well given the choice wouldn’t you rather do business with Wills and Kate over a cucumber sarni and a cup of earl grey?). Just 9 miles wide and 5 miles long, Jersey is 45 square miles of hidden coves, sandy beaches, coastal walks and pretty villages. Oh and did I mention it is also a VAT-free tax haven? Ooooh the sweet shop raid could be back on my friend. As if it couldn’t get any more magical, at low tide, the island grows an extra 18 square miles and as the channel reclines it’s possible to walk up to two miles out across the sea, following the trail once blazed by migrating woolly mammoths past exposed gullies and reefs. At under an hour’s flight from London this weekend break was an easy sell and I was checked in before you could say abracadabra. Despite its tiny size, Jersey has almost 12,000 beds for tourists to decide between. But there was no deliberation for me, it was Longueville Manor from day one. With the iconic Relais & Chateaux seal of approval proudly mounted by the door, this 14th century manor house in St.Saviour is the stuff my childhood dreams should have been made of! Stuff soggy tents and mud huts, this stunning 5* property has hundreds of tales woven in to every nook and cranny – from the Victorian walled garden and tranquil lake to its atmospheric oak-panelled dining room and (supposedly) haunted tower – and all surrounded by 15 acres of woodland to explore. The hotel has been in the Lewis family for three generations and current owners, Malcolm and Patricia Lewis have created a luxury home from home experience where guests feel like part of the family the second they step through the door – we loved the little touches like the row of Hunter wellies by the door awaiting guests to jump in and explore the grounds and the kitchen garden that was growing Jersey royals under a bed of fresh seaweed on our arrival. Arriving at dusk the grand manor house exuded a warm sepia glow, with elegantly aged wisteria framing its door that was held open by a gleaming bellboy. With tales of rich clotted cream, succulent spuds and some of the best seafood in the world awaiting on the island it was straight to dinner. The award-winning restaurant is split in to two distinct areas: the Garden Room and the Oak Room. The Oak Room was perfect for a romantic foodie initiation to the island – clad in dark carved oak panels rescued from a sinking Spanish galleon. On our visit Relais & Chateaux were celebrating their birthday so we opted for the special 60th anniversary celebratory menu. It was an instant hit with chef Andrew Baird and his team parading creative dishes like delice of sole, Angus beef with morels and our star dish; deep water Jersey crab with watermelon, cucumber, warm crab claw and yuzu. With four Michelin starred restaurants on this tiny island and just three days to indulge in as much Jersey produce as we could cram in it was time for bed – but oh what a start to our gastro adventure. The next day, I awoke exhausted (probably all of that dreaming of woodland treasure hunts and climbing ancient towers – random). Having torn myself out of our enormous bath tub overflowing with aromatic REN bubbles I was ready for our first full day on Jersey. A steaming coffee soon got me back on track and as I tucked in to the hotel’s incredible continental breakfast in the garden room (probably the best hotel buffet I have experienced – think fresh pressed juices, homemade yoghurts with home-grown honey, salmon smoked on the grounds and even a leg of jamon iberico) as the sunlight streamed in. 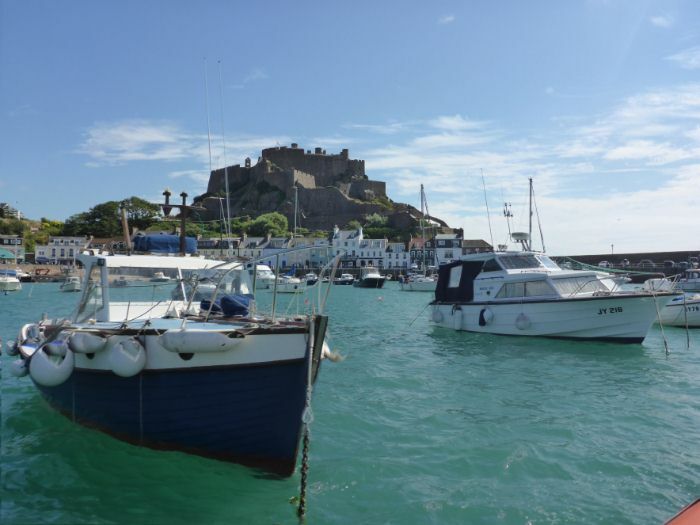 A short drive away along the island’s east coast is the popular fishing village of Gorey. Overlooked by Gorey Castle, the pastel painted seaside village is host to a bevy of cafes and restaurants – but it was Sumas Restaurant’s lobster thermidor that was calling us at lunch. The relaxed eatery offers unpretentious fine dining with a small terrace overlooking the bay. Our twice-baked cheese soufflé starter was melt-in-the-mouth and the freshly caught lobster was a winner. That evening our first Michelin-starred dinner awaited at Bohemia Restaurant, so with no time to lose (just weight) we headed off for a post-lunch ramble around the nearby fishing port of Rozel. With a quaint cove of white sands this snug bay is a popular local haunt for an al fresco lunch. 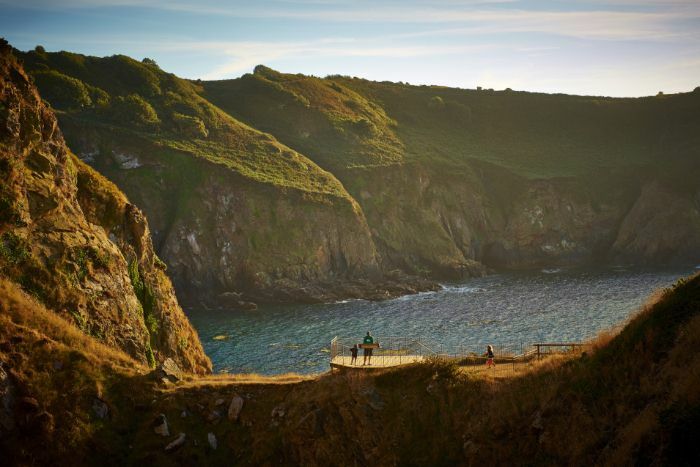 North of Rozel, the east coast’s hidden coves give way to the northern coastline’s dramatic rugged cliffs – a haven for hikers. We headed to Rozel point and managed to slipstream a local fisherman masterfully dancing across the craggy rocks and tiptoeing across a makeshift bridge towards the peak where we stood looking out across the channel at nothing but a misty horizon – bliss. Having worked off our lunch we had just enough time to enjoy a Longueville Manor afternoon tea – I can safely say that that fluffy scone, engulfed in thick Jersey clotted cream, will feature in my dreams from now on. It also came with a side of ‘black butter’ a traditional Jersey conserve that combines cider, apples, lemons, liquorice and spice – it’s tastes like Christmas in a jam. Having donned my most forgiving elasticated dress created a stomach distracting bouffant that Elnett would be proud to sponsor we were off to Bohemia Restaurant in the nearby capital of St.Helier. Currently the highest rated restaurant on the island and having held a star for a decade it was Bohemia that first kicked off Jersey’s Michelin-starred culinary scene. Headed up by Chef Steve Smith the restaurant caters to a huge array of tastes with eight different menus available to choose from. The restaurant has a 60s style interior and a separate bar area, both of which were surprisingly quiet on our visit. At first we were a little confused, but as the plates began to flow it all made sense – at Bohemia, the food is the star of the show. Steve Smith obviously enjoys playing with texture, creating an element of surprise and intrigue in each dish. Every course was a delight but they saved the best until last… in a Hestonesque playful manipulation of texture, what seemed to be a red velvet sponge arrived. As my spoon touched the sponge it cracked, it was actually a shell of air-sprayed burgundy cocoa butter which enveloped layers of indulgence… a crunchy toasted hazelnut praline base topped with a smooth coffee chocolate mousse, followed by a zingy whiskey and lemon jelly and a malty dulcey chocolate mousse. Now that is a pudding worthy of a gold star if ever I have seen one – no wonder ‘The Whiskey Pudding’ was announced Britain’s 6th best dish by the Sunday Times Food List. Having slept off the Bohemian decadence of the night before amidst dreams of gold-encrusted plates, magic chocolates and flowing champagne, Sam and I jumped into a pair of the hotel’s help-yourself Hunter wellies and walked off yet another hearty brekkie before heading to the spa. This new addition to the hotel is worth booking early, it has just one treatment room currently but my REN massage courtesy of therapist Natasha eased away my walking wounds and left me raring to continue my Jersey treasure hunt. With not one, but two Michelin-starred restaurants planned for the day it was time to get hiking! Inspired by the beauty that we had seen in the distance from Rozel the day before, we headed to the island’s northern coast to the historic Devil’s Hole. This giant crater is thought to have gained its dramatic name when a shipwreck washed in to the cavern back in 1851. A local then decided to get the wrecked wooden figurehead carved in to a statue of the devil. Today a metal replica of the statue stands within a pool on the way to the crater, setting the scene for this dramatic clifftop walk. Having taken in the turquoise waters, rocky coves and gauze lined paths of the north, we were ready to venture west, for our Michelin-starred lunch at Ocean Restaurant. Sandy St.Ouen’s bay dominates the western coast and an inland a wetland area is thriving with birdlife. With the weather having taken a rapid turn from Autumnal sun to wild wind and rain we braved a walk along the popular beach towards The Altantic Hotel’s Michelin-starred restaurant, Ocean. Stepping in to this pristine restaurant is reminiscent of boarding an elegant ocean liner. The spacious dining room is clearly inspired by its coastal surrounds with a classic muted palate of sand, slate and perfectly starched white tablecloths framed by shuttered windows overlooking the Atlantic. Chef Mark Jordan is dedicated to working with genuine local produce and on our visit we sampled the exclusive local beef from Manor Farm which can only be enjoyed at Ocean Restaurant. However, as the name suggests, it is the seafood that reigns supreme here and on our visit the lobster, caught straight from the bay below, was a winner – mixing moist poached flesh with delicate tempura and Ebene caviar it looked like a piece of art and tasted like a little bit of heaven. Suitably stuffed we stepped out in to the salty gale and made our way along the last stretch of the Jersey coast left for us to discover- the south. Our journey took us past the island’s busiest resort beach, St. Brelade’s bay and towards the island’s capital, St. Helier. In the distance, on a rocky islet, Elizabeth Castle sprung to life, dramatically illuminated against the backdrop of the sea. Having defended the island for 300 years (from invaders, not the tax man), the historic castle has played host to everyone from Sir Walter Raleigh (former Governor of Jersey) to King Charles II. Today, the castle can be reached on foot at low tide, or by two jolly boats named Charming Betty and Charming Nancy at high tide. Now this really is the stuff that childhood dreams are made of, once inside you can do everything from climb the battlements to explore the turrets and bunkers – and then finish off on the beach with an ice cream, what’s not to love? With just hours to go before bedtime, we had just enough room to fit in one more Michelin star and headed off to Ormer. Named after a local shellfish the two-tiered restaurant is reminiscent of a stylish Parisian bistro (think a more subtle Balthazar), marrying cosy teal velvet sofas with art deco chandeliers and an open kitchen where acclaimed chef Shaun Rankin and his team are busy at work. We perused the menu but with only hours left on this magical island there was one clear choice, I loosened the belt and ordered the tasting menu. It featured dishes such as scallops with glazed chicken wings and roasted foie gras with Beaufort cheese veloute but our favourite dish by far was the first; cubes of fresh raw tuna with avocado puree, Bloody Mary jelly and cucumber sorbet, genius. Defeated by Jersey’s calorific generosity and somewhat tipsy, we headed back to Longueville and there was one feature still to try… the outdoor hot tub. I’m not going to lie, a bikini was a daunting affair after the 48 hour eatathon I had just completed. Just as we sunk in to the forgiving waters which released their steam in to the crisp autumn air a torrential rainstorm began. Sam and I looked at each other for a second and then shook out heads, shut our eyes, and embraced the Jersey elements. This island may only by 9 miles by 5 miles, but as my Grandfather once said, you don’t get diamonds as big as bricks, and we were savouring every second of this dreamy isle.